Challenged to use eggs in a dish that will showcase them, and especially benefit from the use of Davidson's Safest Choice Eggs, which are pasteurized, I immediately thought of oyako donburi. This is Japanese comfort food in a bowl. Donburi means, quite literally, 'bowl' - and in Japanese food, it refers to any of a number of popular dishes that consist of a big bowl of rice topped with something. 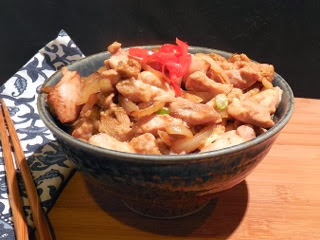 Oyako means 'parent and child' - so appropriate for a chicken-and-egg dish! This dish is quick and easy, uses one pan (well, besides the rice cooker) and can be ready to serve in about 15 minutes. Savory onion slices are cooked with chicken, and then a seasoned egg mixture is poured in. Some prefer the eggs not quite cooked through, which is where the pasteurized eggs really shine: they don't need to be cooked to be safe from salmonella! I prefer mine gently set, so the chicken and onions are tasty bits in a quivery tender egg nest. The juices run down into the bowl of rice, making every bite a total pleasure. Make your rice: I use a rice cooker. Start the rice going while you set out your ingredients and cook the topping, it will be ready just in time. Stir the egg in a small bowl to break it down a bit and add the dashi, soy sauce, and mirin. Set aside. In a skillet (small for 1 serving, larger for 2 servings) heat the oil, then saute the onion slices until they are limp and turning translucent. Add the chicken, and saute until cooked through, stirring often. Add the green onions, and turn heat to medium-low. Add the egg mixture to the pan, and cook until the egg is just barely set. Scoop cooked rice into a bowl, and top with the chicken/egg mixture. Add a bit of pickled ginger to the top if you like, and enjoy.